I'm delighted to announce that I am on the line-up for Clunes Booktown Festival (VIC), Dunedin Writers' Festival (NZ) and Sydney Writers' Festival this coming May. For more information, please head over to my Events Calendar, where you'll be able to find out about dates, event times, addresses and ticket prices. It is with great delight that I can let you all know that I will be touring the UK and Ireland this February to speak about my second novel, The Good People. There will be five in-conversation events throughout the UK, and one in Dublin, Ireland. For more information, please head over to my Events Calendar, where you'll be able to find out about dates, event times, addresses and ticket prices. My Irish, English, Scottish and Welsh readers, I can't wait to see you there! In addition to these events overseas, I also have the joy of appearing at two upcoming Australian festivals - Perth Writers Festival in February, and Adelaide Writers' Week in March. For details on the sessions I'll be appearing in, please head to my Events page. I recently had the pleasure of speaking with Richard Fidler on ABC Radio's Conversations program about The Good People and the fairy lore of Ireland. Our chat is now up online at ABC Radio, and can also be downloaded here, or as a podcast here. Alternatively, you can listen to it here! In pre-famine, rural Ireland, people dwelled within layers of folk and fairy lore connected to every aspect of their lives. At the milking of cows, in the nurturing of expectant mothers, and in the old women paid to 'keen' after a death, ritual and superstition were ever-present. Rural Irish folk used the term 'good people', to refer to their fairies, who were nothing like modern iterations. These fairies could bestow favour or grave misfortune; including abducting people, and transforming them to changelings. Australian novelist Hannah Kent discovered an account of a crime committed in pre-famine County Kerry which she couldn't forget. The crime and the accused were steeped in 19th Century folk culture, and the details were shocking. To imagine how the events unfolded, Hannah immersed herself in the lore and landscape of rural Ireland, and the lives of three women. The Good People is published by Picador. 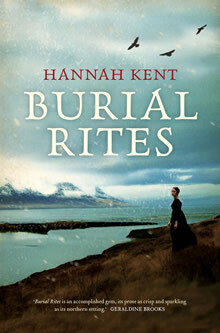 Listen to Hannah's 2013 conversation with Richard, about her life and the story behind Burial Rites.